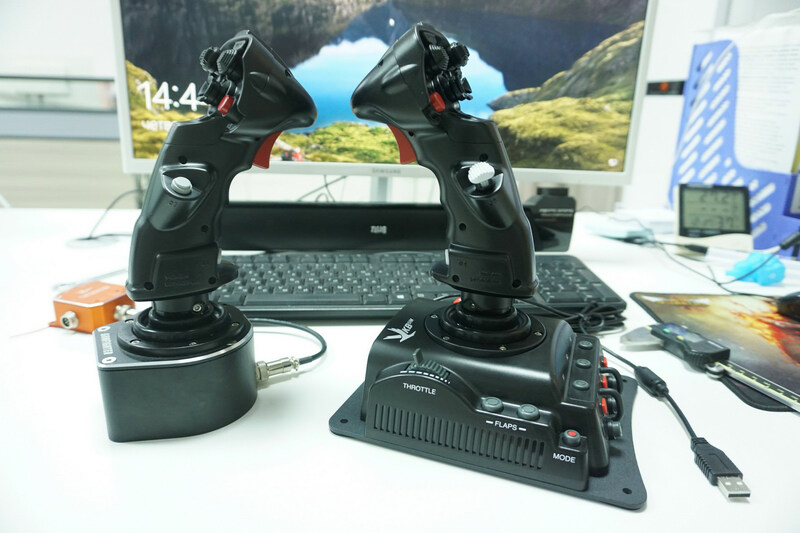 UIV, VKB owner and chief engineer, has dropped a little sneak peek on another forum, and since it's out in the open now, here's a couple of teaser images of the VKB Kosmosima SCG (Space Combat Grip). Of course, it's also very much usable in DCS or IL-2 or other sims. Out of curiosity how does this effect MCG left and standalone twist plans? No break lever similar to what MCG have? I guess there's not enough room to put something here? But if there's, I would experiment with either a small trackpoint like we see on Lenovo keyboard or a small Track Ball. zenmonkey wrote: Out of curiosity how does this effect MCG left and standalone twist plans? Yeah i hope MCG LH grip is in development! Left-handed MCG would be best. But honestly i really just want break lever on left joystick as well (that is kosmosima with break lever will do as well). Two lever on two joysticks particularly replace need for pedals. For spacesims in particular you can control both forward and backward thrust with it, which is very handy. Indeed. They're great as an extra set of axes (in my case vertical movement). It's neat to see the SCG but I will still be holding my breath for a left handed MCG. There appears to be more features on the MCG than on the SCG and for HOSAS that's what counts from my perspective. The SCG would make more sense if VKB is still planning on the Enhanced Control Panel expansion for Gunfighter. hon0 wrote: I guess there's not enough room to put something here? I would rather have a slider for non-precision throttle control. Yes, a slider for allowing to set the throttle when flying long distances would be really helpful. There could actually be enough space for one on the thumb rest in the middle. I support that idea. Or maybe do a scroll wheel like your competitor. 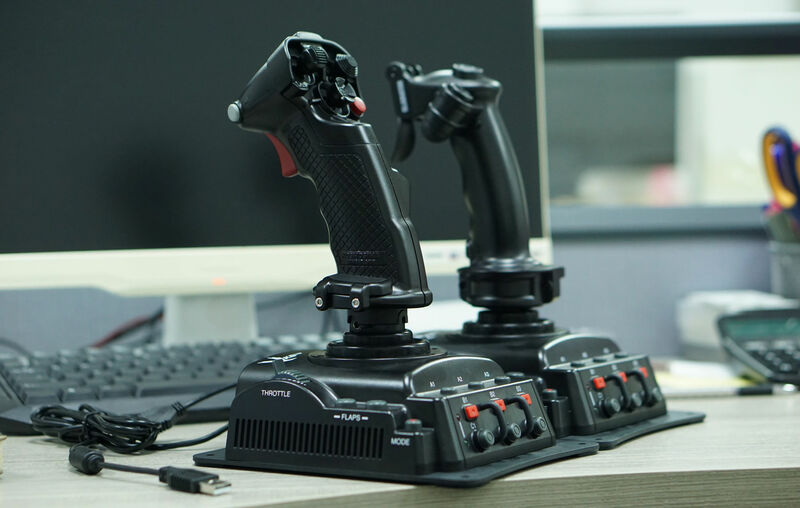 Both ideas are good and very helpful to set the throttle for long flight while still having hands on sticks. Scroll wheel or slider on that free space are nice additions but not a must have thing. And make sure that the twist mechanism is "robust" enough because gameplay in spacesims is extremely intense. May be encoder? Similar to mouse scroll. Slider = linear potentiometer ->friction-> wear. - Swap the forward/backward axis from absolute to relative. - Electronic trim that axis, this mean : move axis to set the desired speed, HOLD the electronic trim button, bring back the axis to neutral, release the electronic trim button. (Similar to what we find in helicopter). - 2 Buttons to manage an axis. See here to see how War Thunder implemented that. Would it be possible to have a twist adapter that work force sensor instead of displacement, or even better, that combine both? The reason I'm looking for a force sensor twist axis is that it can provide much greater range through force application than a displacement twist could ever provide. And in Star Citizen, phew, this range is needed to deal with those inhuman acceleration..
Last edited by hon0 on Thu Jul 12, 2018 3:50, edited 1 time in total. I currently have thumbwheel for a throttle on my T1600. Works well, though a wheel with a notch would provided a little tactile indication of position. They really need soemthing for throttle control there, scroll wheel at the minimum.